Stand it to attention, fold it double, or you can even stick a pin or brooch in it for a snug fit. 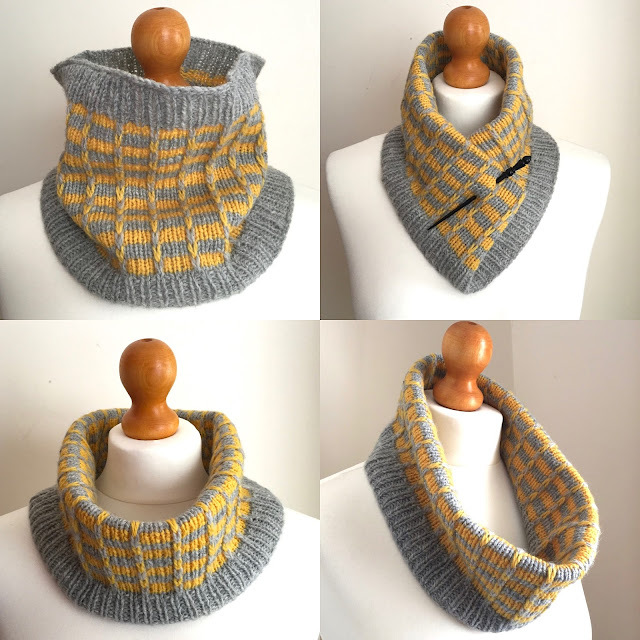 It can be easily customised too - cast on a greater number of stitches (in multiples of four stitches), for a longer cowl or knit more repeats to make it deeper, like a snood. 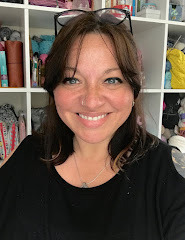 The cowl is worked in the round so there is no sewing, apart from weaving-in a few yarn tails, and because of the slipped stitch placement, you don't have to worry about the joins or 'jogs' between the stripes - this is a 'jogless' stripe pattern. 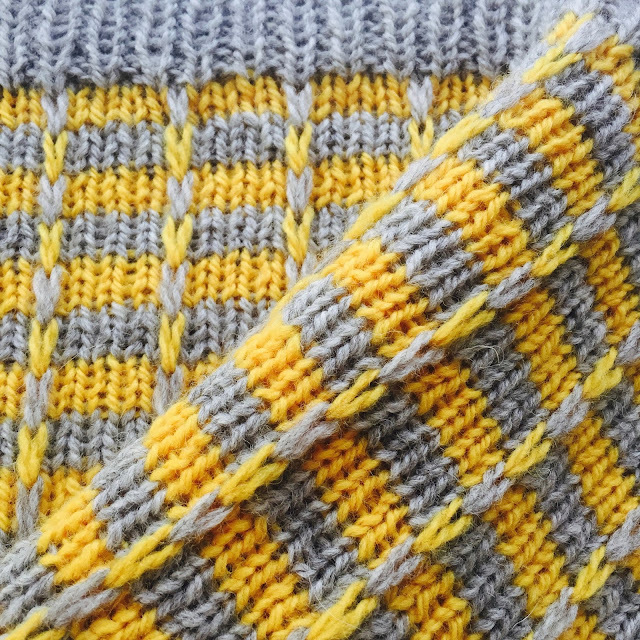 The pattern sample was made using Cascade 220 Sport (100% wool) in Silver Grey and Goldenrod (one ball of each) although test knitters also used different double knitting or sport weight yarns in all sorts of colours and blends - just be sure to make a swatch if substituting yarns, as you may need to alter the number of cast on stitches. Whichever yarn or colours you choose, it's a fun project and one which most knitters will be able to complete quite quickly and easily. Screenshot. 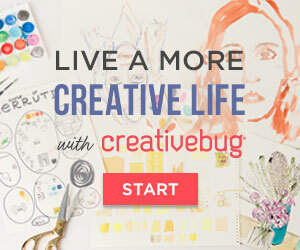 The app is pre-loaded with six free patterns, including mine! Fittleworth is currently available exclusively via the new Love Knitting iPad app* - you can read about it here. When you download the app from iTunes, you'll find it as one of the selection of pre-loaded patterns. 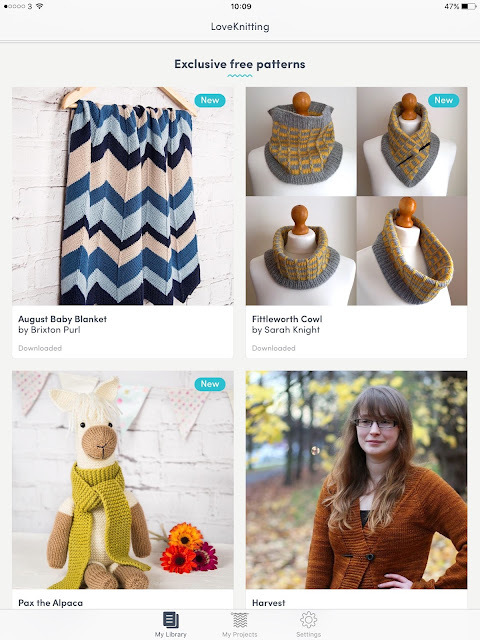 The app is free (and very cool) which means the pattern is free for you too. I really hope you like it and look forward to seeing your finished projects - please feel free to use #fittleworthcowl on social media (and tag me!) so I can see your projects.